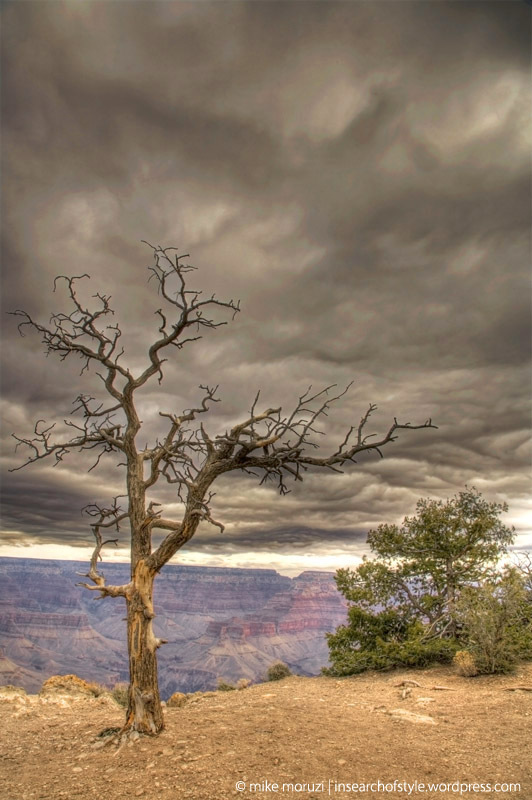 While much of the rim and the lookouts are sealed off with fences to keep the unwary traveller from toppling off the side to experience a rather precipitous drop, there is still much of it that is wide open leaving only common sense between you and the bottom of the canyon. If you take the kiddies to the canyon, make sure you hold their hands! On arriving at the canyon on Sunday night, we made a brief stop to watch the remains of the sunset. It had been snowing and raining that day and it was now comfortably below freezing. The parking lot and the foot paths were all coated in a thin, shiny, very slippery coat of ice. Over the next day or two, we saw more than one person being carried out on stretchers after they’d slipped and cracked their heads. While the rangers did take care to sand the roads, no one seemed to think to sand the paths! That was especially alarming considering that precipitous drop I mentioned above. Braving the slippery trails, we made our way carefully to the lookout at Yavapai to take in the view. We were making our way down the very icy stairs when I belatedly noticed that the railing (protecting us from that drop) topped out about three steps down. That is, right at the side of the first couple of steps was a 100 meter drop straight down! I held my kids hands all the tighter as I imagined how easy it would be to slip right off the side. Despite heading south to Arizona for a week’s vacation away from winter, I found snow anyway. It seems that at 7000 feet (average elevation of the south rim of the Grand Canyon), it can get pretty cold in the winter. For the two days we were at the Canyon, the temperatures were exactly the same as they were back here in Edmonton. I capture this image around sunset at Hopi Point. For sunsets, I really like Hopi Point because you get a great view to the east and west and because there’s lots of room for all the people. With all the room, you don’t have to just stake out a spot at the railing and stay there the whole time. You can move around and get different angles. For this image, I really wanted this scrubby little bush in the foreground, but there was a sign in the way and two photographers with tripods, one on either side of this sign totally blocking my access. Thankfully, I’m not too concerned about what people think so I got down on my hands and knees and crawled under the sign. I sat on the ground with my tripod splayed out to get down really low. With my camera lens sticking out through the railing I managed this unobstructed view of the canyon. I’m back online and all ready with some new travel pics. The family and I have been down south in Arizona for the past week visiting my folks. After an easy flight down to Phoenix, we did a little 1,600 km (1,000 mile) road trip from Phoenix to the Grand Canyon to Lake Powell and back. We saw a few highlights along the way like the eye-catching red rocks of Sedona and the very popular Antelope Canyon. Needless to say, once I’ve sorted the images, I’ll have a few to share here over the next week or so. My hope is that I’ll have improved over my previous set of Arizona images that featured way back in ancient history on Day 41 of this humble, little blog. 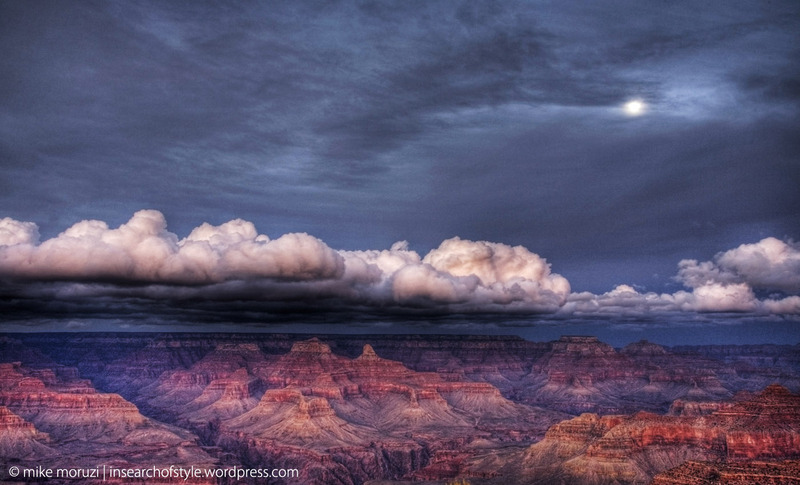 This image is of sunset from Hopi point on the southern rim of the canyon looking north. I really liked the way the clouds were caught on the peaks rising from the canyon. I’ve changed my blog layout today. I wanted a theme that would allow me to present the photos in a larger format and to make them more of a feature of each post. After a thorough look at almost all of the WordPress themes, this is the one that I thought was best for photos. Not surprisingly, this is the one that many photo bloggers choose so I guess I’m joining the party. I hope you like the new look. You can either use these big arrows to move between posts or you can click on the left or right of the photo. 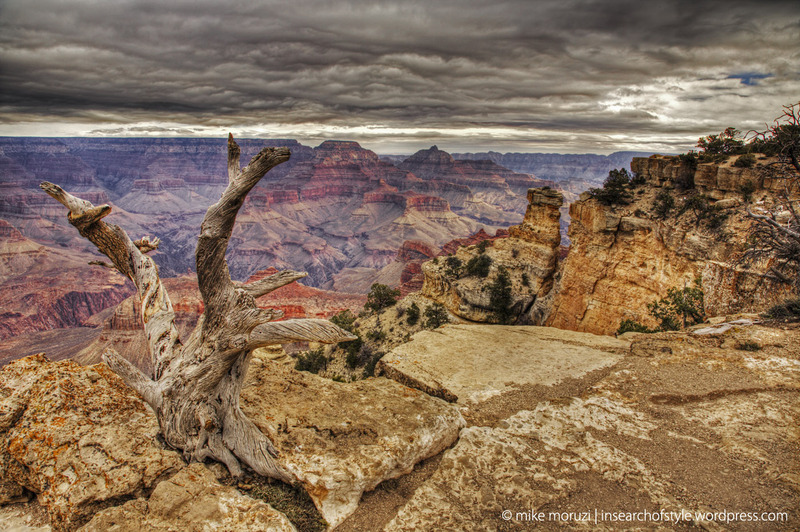 Another HDR from the Grand Canyon. 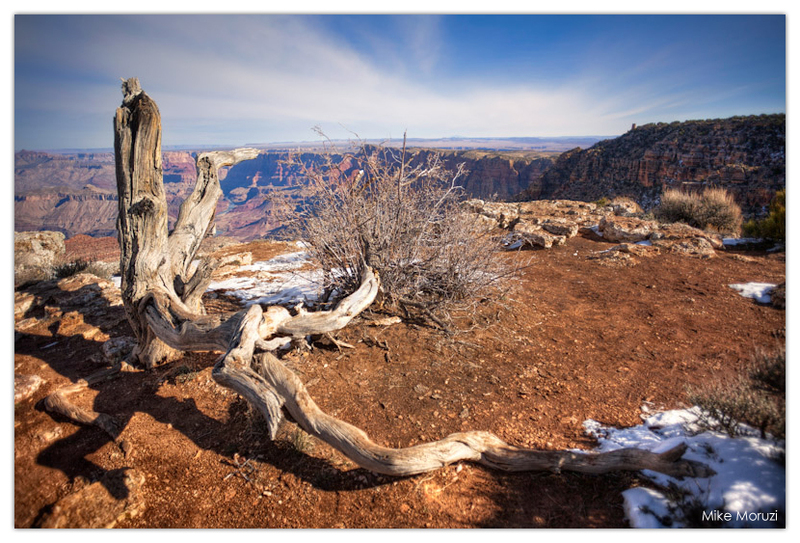 Tree stumps like this one line the rim of the canyon. Not only is this the high country, it is close neighbours with the Mojave and Sonoran Deserts so it’s no wonder the climate here is dry. 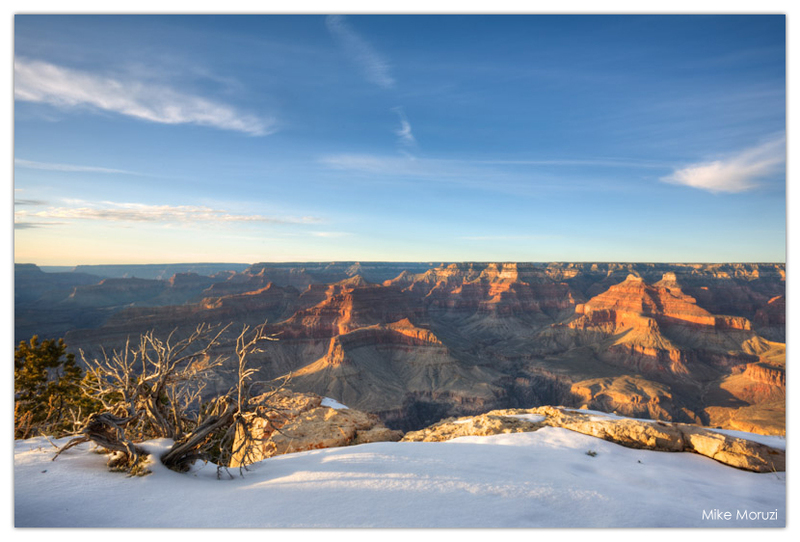 Today’s photo is an HDR panorama assembled from four bracketed shots. I used Photomatix to blend each of the bracketed images and then used Hugin to stitch them into a single seamless panorama. There was some cleanup once the stitching was done to fix hot spots and some weird colour side-effects of the process. This shot was taken at mid-day when the clouds were at their heaviest and the light was really flat. In just a day and a half at the Grand Canyon, I managed to capture 600 images. Some people will think that’s a lot. Some will think it’s not so many. What I do know is that it is enough for me to rest on my photographic laurels a bit this week and continue to work through a few more of my canyon images. Going into this trip, I planned to generate some HDR images so I did a lot of bracketing to prepare. For the few people who haven’t heard of HDR, it stands for High Dynamic Range. It’s simply a way of extending the range of light that you can capture in a single image by combining bracketed images. For those who want to learn all about HDR, go to Stuck in Customs. This, my first attempt at HDR, was shot just after sunset at 6:21pm from Hopi point along the southern rim of the Grand Canyon.